This article is a brief guide to solving the majority of problems that you will find when you upgrade your game project from WaveEngine 2.3.1 version to 2.4. Although WaveEngine has an upgrade tool that runs when you open an old game project with the current WaveEditor 2.4, you can find some issues listed below. 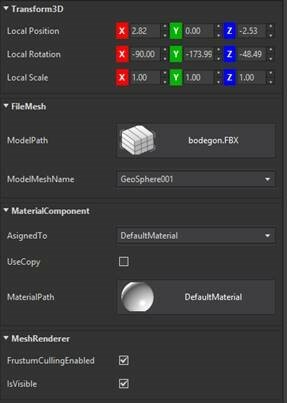 An important point to bear in mind is that Model, ModelRenderer and MaterialsMap components are deprecated, so you should begin to use FileMesh, MeshRenderer and MaterialComponent respectively. For more details, you can read the following article. 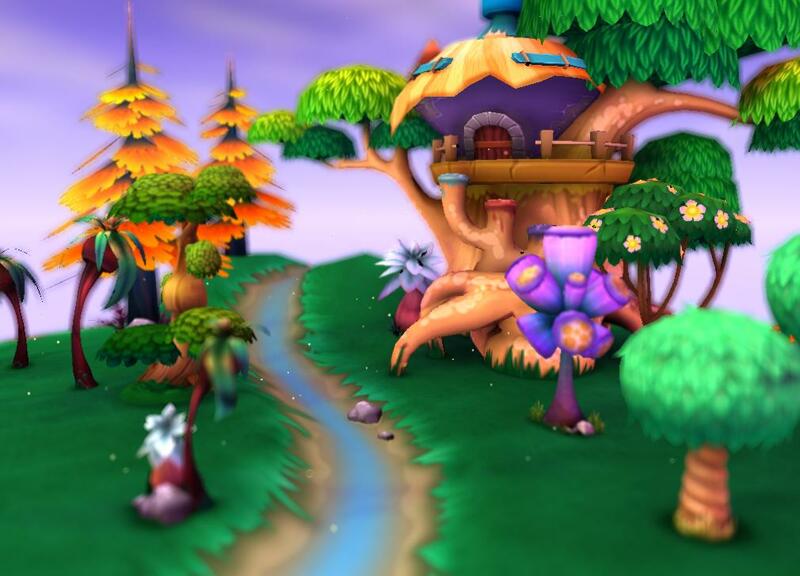 In WaveEngine the use of Services can be very useful when developing your applications / games. And, as you can create and register your own services you can add cross-scene and global elements that provide useful logic, like score managers, entry points to native libraries, and much more. However, until now, Visual Editor didn’t allow you to register your own services, so you had to do that from code. That could cause problems: Creating components that use custom services could be tricky to debug in our Visual Editor, or depending on your code, it may directly provoke malfunctions in your scene. 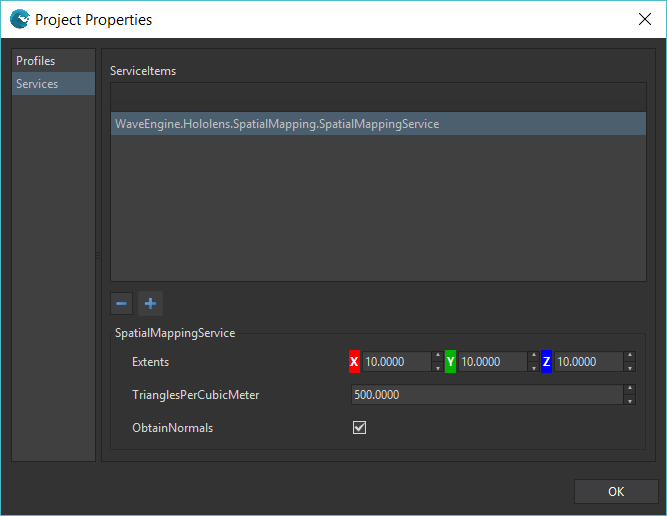 Luckily, WaveEngine 2.40 has introduced the possibility of registering and setting up your custom services, as well as some Wave Extension services. Continue reading Using Wave Services from Visual Editor. Posted on 21 August, 2017 23 August, 2017 Author antonioavilaLeave a comment on Using Wave Services from Visual Editor. We have improved the async/await support in WaveEngine 2.4.0 by replacing our Dispatcher and TaskScheduler services with a custom implementation of .Net TaskScheduler and creating some useful helpers. The biggest change is the substitution of Dispatcher and TaskScheduler services. The new way to execute code in the foreground or background threads is by using the new helper methods from WaveForegroundTask and WaveBackgroundTask static classes. If you are using WaveServices.Dispatcher, you must replace it to use WaveForegroundTask. If you are using WaveServices.TaskScheduler, you must replace it to use WaveBackgroundTask. Both new ways to execute code return a .Net Task, which integrates easily with async .Net code. When a task is executed in the Foreground thread, like with the Dispatcher service, it is executed in the next update cycle. With the Background thread, the tasks are executed sequentially in a specific thread that can access the graphic resources. This allows us, for example, to load textures. The old TaskScheduler executes the code in a .Net thread and without taking concurrency issues into account when accessing the graphic context. In comparison, this new service ensures that each task is executed in the same thread and sequentially. One useful helper introduced in the new WaveEngine version is the ConfigureWaveAwait extension method. It allows us to configure how the await continuation is handled. Just as the .Net ConfigureAwait extension method allows us to configure if we want that the continuation of the await is executed on the captured context, the method ConfigureWaveAwait allows us to configure where the await continuation is executed: in the Foreground or the Background thread. // This code is executed in the foreground thread. // This code is executed in the background thread. The WaveTaskContinueOn enum also includes other options. The Default option acts as if the ConfigureWaveAwait has not been used, and the ThreadPool option acts as if the ConfigureAwait(false) from .Net has been used. With the inclusion of GameActions, WaveEngine has acquired an excellent way to define a flow of actions that is integrated perfectly with the common scenarios in a game (like animations, play sounds, wait for a condition, etc.). 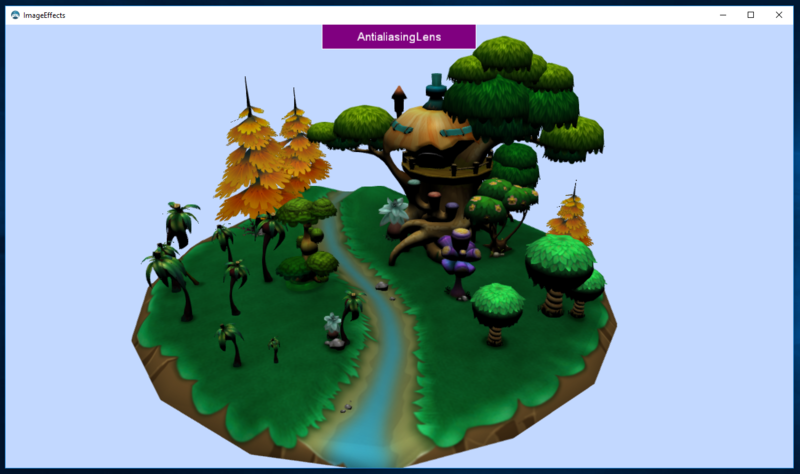 In this release, we have included the AsTask extension method that simplifies the way that .Net Tasks and GameAction interact with each other. // and configure the await to navigate to the scene in the foreground thread. I hope you find it useful when you want to use async code in your game. It is the first step and we will work to include new async APIs and features in next releases. WaveEngine 2.4.0 includes official native support for NinePatch textures (also known as 9-slice). To know more about what that kind of textures is, read our previous post about it. As this version allows you to add textures and mark them as “NinePatchType: FromTexture”. 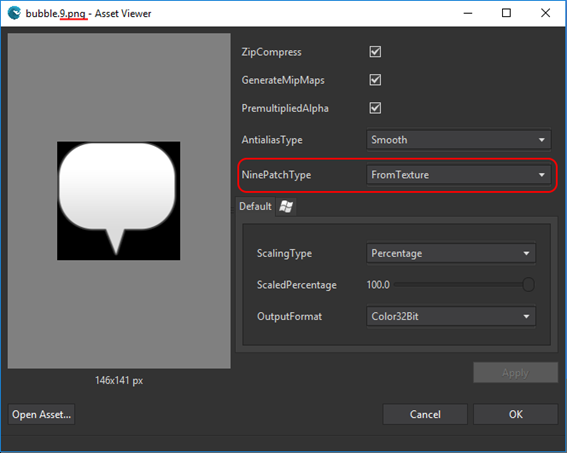 This option will be automatically selected if your texture has the extension “*.9.png”. We have improved the Oculus Rift integration In WaveEngine 2.3.1 updating from 0.7.0 to 1.10.0 Oculus API. One of the most important improvements is the Oculus Touch support is that it allows you to have hand controllers in your VR games.